Did you know that caffeine is considered a psychoactive substance? Consumed regularly by over 90 million adults, caffeine is thought to be America’s leading nonprescription drug. However, unlike drugs of abuse that lead to dopamine release, caffeine does not act on the dopaminergic structures in the brain related to reward, motivation and addiction. Caffeine is naturally occurring in tea, coffee, kola nuts, cocoa beans and more than 60 plant species. It is also added to soft drinks, energy drinks, pharmaceuticals and a number of OTC medicines, including analgesics, diet-aids and cold remedies. Data suggests that genetics may play a critical role in determining the amount of caffeine one is likely to consume, as well as any side effects of consumption. Some people are less sensitive to the stimulating effects, while others may see their blood pressure rise or their sleep negatively affected by caffeine consumption. Following oral consumption, caffeine is absorbed into the bloodstream and body tissues. Its effects can last for several hours depending upon how quickly or slowly it is metabolized by the body. The liver is largely responsible for caffeine metabolism, and certain lifestyle factors appear to determine how quickly caffeine is utilized and eliminated. Smoking status, liver disease, alcohol consumption, diet and some medications may all influence caffeine’s effects. For example, smoking stimulates caffeine clearance, whereas alcohol intake prolongs caffeine’s effects and decreases clearance. As a central nervous system stimulant, caffeine can boost alertness, enhance cognitive performance, improve energy and aid athletic endurance. U.S. dietary guidelines, as well as the European Food Safety Authority (EFSA), advise that daily consumption of up to 400 mg, equivalent to 4 – 5 cups of coffee, can actually be part of a healthy balanced diet and active lifestyle. For genetically predisposed caffeine-sensitive individuals, one cup can cause uncomfortable or jittery side effects. Ingesting greater than 400 mg daily or more than 200 mg in a single dose can result in insomnia, irritability, and nervousness, as well as tachycardia in those who already have a rapid heart rate. Consumed very quickly in high doses, caffeine has the potential to be both toxic and dangerous to health. However, the negative effects of high-dose caffeine consumption appear primarily in a small group of caffeine-sensitive individuals. Moderate consumption does not ordinarily lead to health risks. In fact, recent studies show that coffee in moderation may actually boost longevity and potentially provide protection against cirrhosis, some cancers and type 2 diabetes, as well as Parkinson’s, Alzheimer’s and cardiovascular diseases. So how does caffeine affect the brain? 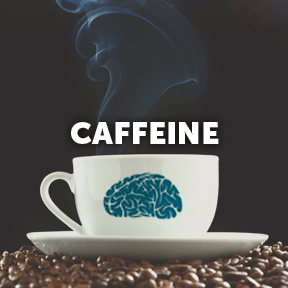 Caffeine interacts primarily with the brain’s adenosine receptors. In so doing, it alters neural activities that influence mental performance, resulting in increased alertness and wakefulness. Adenosine is a naturally occurring compound commonly found in DNA or RNA. It is present in various forms in all bodily cells and is an essential component of energy production and utilization. Adenosine receptors are widely distributed in the central nervous system, where it acts to depress neuronal activity. When adenosine binds with receptors, it causes drowsiness, which in turn causes blood vessels in the brain to dilate, letting in more oxygen during sleep. To a nerve cell, caffeine appears structurally similar to adenosine, which allows caffeine to bind with adenosine receptors essentially blocking adenosine activity. Contrarily to adenosine, caffeine speeds up nerve cells, constricts blood vessels and increases neuron firing. Constricting blood vessels in the brain can help to stop a vascular headache, which is why some headache remedies contain caffeine. Increased neuron firing causes the pituitary gland to sense an emergency of some kind, activating the flight or fight response and signaling the adrenals to produce adrenaline. So, after consuming a big cup of coffee, the pupils dilate, the heart beats a bit faster, blood pressure rises, the liver releases sugar for increased energy and muscles grow tense and ready for action. Who knew your morning cup of joe could actually elicit such far-reaching effects? Largely as a consequence of blocking the uptake of adenosine, caffeine has profound effects on many other major neurotransmitters such as dopamine, acetylcholine, serotonin and, in high doses, norepinephrine. By helping to regulate neurotransmitter balance, caffeine may enhance mood and suppress appetite. Cognitively, caffeine appears to sharpen reasoning, concentration, decision-making and perception. Physically, it improves speed, endurance, energy output, and reaction time. Therapeutically, in moderate use, it appears to protect brain cells from certain kinds of long-term damage, while also aiding pain relief. While the effects of caffeine continue to be studied, you can continue to enjoy antioxidant-rich coffee in moderation and receive not only the short-term effects but the long-term health benefits as well. This entry was posted in Home and tagged Caffeine, Professional Supplement Center, This is Your Brain on Caffeine, Vitamins and supplements, www.professionalsupplementcenter.com. Bookmark the permalink.